Life is not easy for the family with young children that is serious about cycling. There are several awkward years, when the children are to big for baby seats or even trailers, but too little to keep up with the adults on their own bikes. 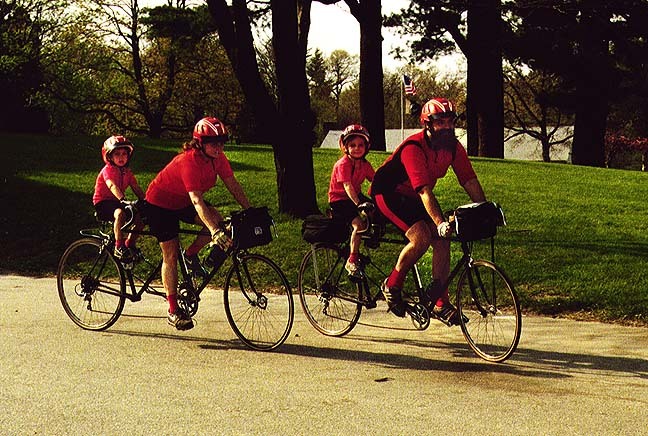 The ownership of a suitable tandem can make all the difference, and allow the family to maintain a continuous cycling tradition. Adults and children can ride together on solo bikes, but it is not much fun for either. The child is likely to feel pushed and overworked; the adult will want to go farther and faster than the child, and get tired of waiting up. An adult cyclist will find that a 10 mile ride at 6 miles per hour with a child is harder than a 30 mile ride at 18 miles per hour, even though both take the same amount of "saddle time". The slow pace will cause less of the adult's weight to be borne by the legs, and more by the tush and hands. Although the slow, short ride is easy on the legs and lungs, it is more likely to cause saddle sores, sore wrists, hands and necks to the adult members of the group. Children are weaker than adults, and often have less physical endurance. Children's bikes are usually less efficient than adults: heavier in proportion to a child's weight; often without a good seated riding position, being designed for acrobatic riding; often with only one drive ratio, or only a limited range. Most children are not good at choosing among what gears a bicycle may have. Children lack the experience to know their own limits. They may start out like gangbusters, leaving the adults in the dust, until they suddenly bonk, and it becomes painfully difficult for them to keep up any kind of speed at all. At this point, you may have to call for a sag wagon. In addition, a child's "street smarts" and traffic skills will usually not be up to adult level. This may severely limit where a family can ride together, if parts of the desired route are too tricky for the child to negotiate safely. Having the child ride stoker on a tandem can solve all of these problems! Depending on the child's strength and motivation, an adult riding a tandem with a child stoker will be more or less as fast as the same adult on a solo bike. When cyclists of greatly different natural speed capabilities and preferences ride together, a certain amount of friction is inevitable. This friction is largely proportional to the degree of difference in speed. In contrast, the natural togetherness and camaraderie that develops between members of a tandem team can enhance the parent-child bond, and make cycling a truly satisfying family activity. The adult will be in a position to teach effective and safe cycling techniques directly by example. This happens in a natural, non-threatening way on a tandem. There is no need to scold or correct the child as is often necessary when the child is riding solo with an adult instructor. The sight of a tandem with a parent piloting a child stoker is uncommon enough and charming enough that is will often cause bystanders to cheer or offer other verbal encouragement. The natural "ham" in most kids really eats this up, and this adds to the enjoyment of the whole experience. 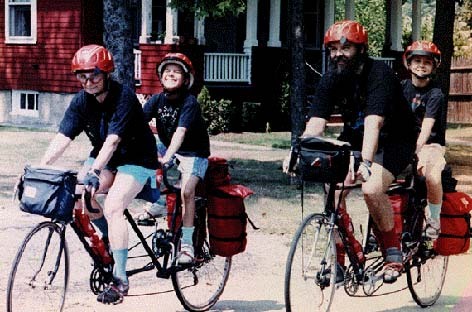 Since the stoker of a tandem does not need to be able to straddle the frame, many pre-teens can ride the back of an adult-sized tandem, even though they need a children's sized solo. In borderline cases, the use of an old-style straight seatpost with separate saddle clamp can just make the difference if the clamp is flipped upside down so that the saddle rails are under the bolt that holds the saddle clamp together. Many inexpensive "cruiser" type tandems have especially short seat tubes, which make them suitable for use with children. The Bike Friday Family Tandem also has a short rear seat tube, and comes apart to ship in two airline-checkable Samsonite suitcases. Burley once made a low-priced model, the Zydeco, designed particularly for this type of use, with a 15 inch rear seat tube; now only available used, though. For smaller children, (or larger tandems) a "kidback" attachment is needed. This consists of a "bottom bracket" that can clamp onto the seat tube of a conventional tandem, so that even a toddler can reach the pedals. Most tandem manufacturers offer kidback kits as an option, and there are also aftermarket units available from various sources. The "bottom bracket" of a kidback is typically 1 1/2-2" forward of the seat tube, so it is best to move the stoker saddle as far forward as possible, either by reversing the saddle clamp if a "pipe" type seatpost is used, or by using one of the forward seatpost adaptors made for use with aerobars. In addition to improving the child stoker's leg angle, the forward saddle position reduces the reach to the rear handlebars. An extra-long stoker stem is also called for with a kidback, preferably one that is adjustable for length. Many kidback users use drop type handlebars flipped over so that the child can hold onto the outside of the "drops". The U-shaped handlebars supplied with many small-wheel and children's bikes also can extend back to where the child can reach them. A child as young as 2 1/2 can stoke a tandem with a kidback attachment, although only for relatively short rides. With time, growth and experience, your stokid will gradually be able to happily complete longer and longer rides. [Toddlers can fall asleep at unexpected times. I could always tell that my son Jacob was falling asleep, because the tandem would begin to slump to one side. Toe clips and straps kept Jacob's feet on the pedals. He never let go of the handlebars. We would stop and rest for a while, and then get back onto the tandem. Before installing a kidback attachment, make sure that it will work with your tandem. "Lady back" tandems may not have a long enough length of unobstructed rear seat tube to clamp the kidback crankset to. "Mixte back" tandems, or any others that feature twin lateral stays will usually not work as kidbacks, because the lateral stays will get in the way of the kidback's chain. The most common arrangement for a kidback chain is to leave the standard crossover drive train intact, except to add a second chainwheel on the left rear. The kidback synch chain runs along the left side of the rear seat tube down from the kidback cranks to this extra chainring. This arrangement permits conversion back and forth between adult and child stokers, by installing the kidback and removing pedals from the regular cranks, or vice versa. Bicycle pedals come in lefts and rights. The main difference is that the left pedals screw into their cranks with left-hand (left-foot? "reverse") threading. This helps prevent the action of pedaling from causing the pedal to unscrew itself. Three of the four cranks on a standard tandem crankset have their pedal holes threaded specially for tandem use. The left-side cranks have chainwheels like normal right cranks, but have left-hand threads. One of the right cranks has no chainwheel, but has a right-hand thread. Only the right-side crank that carries the primary chainwheels is the same as on a solo bike. A kidback that comes as a complete kit will usually have "tandem threaded" cranks, with a left-hand thread on the chainwheel side, right-hand thread on the plain crank. This is fine if the cranks are the needed length. Some kidbacks come not as a kit, but just the "bottom bracket" unit, and cranks must be purchased separately. It can be difficult to find tandem-threaded cranks in the short lengths needed for kidbacks, so sometimes it is necessary to use normal "solo threaded" cranks. It is possible, but inelegant, to use "solo threaded" cranks reversed, but care must be taken to keep the pedals from unscrewing themselves. The pedal threads should be secured with a thread adhesive, (such as Loctite ®) and tightened very tightly. There may also be problems with pedal shape and toe clip installation -- you need either to use double-sided pedals, or to switch the pedal axles. It will not be possible to interchange the pedals back and forth to change between child and adult stokers, because the toe clips will point the wrong way (and besides, the adult probably needs longer toe clips)..
A better approach, when using "solo threaded" cranks, is to reverse the kidback, so that its chain is on the right side. The right front tandem crank must be replaced with a solo type right crank with a chainwheel. The kidback chain runs diagonally down on the bicycle's right side. One of the major causes of friction between members of tandem teams is difference in preferred cadence. Typically, the pilot will prefer a faster cadence than the stoker. The best solution to this problem is to equip the stoker with shorter cranks than the pilot uses. Shorter cranks make it easier to spin at faster cadence than longer ones. This is particularly a concern with a child stoker, who not only is probably unaccustomed to a fast cadence, but also has much shorter legs than the pilot. An alternative to buying short cranks is to use "crank shorteners", which attach to existing cranks and provide one or more pedal mounting holes farther up the crank than the standard holes. These do spread the pedals father apart, producing a bit of a bowlegged stance for a small child. Even the youngest stokid should have toe clips (or clipless pedals), even for stokers who don't use toe clips for solo riding. Since the stoker can get clipped in before the bike starts up, it is very easy for even very young children to use them. Toe clips improve the child's ability to spin, and also keep the child more securely attached to the bike. If the child loses contact with the pedals while the adult continues pedaling, the whirling pedals may bang up the child's feet or shins fairly badly. For this reason, plastic pedals are often preferable for child stokers. In particular, metal BMX pedals with sharp teeth should be avoided. Although usual tandem practice is to link the front and rear pedals on each side with a bungie cord to keep the toe clips right-side-up, this doesn't work too well if one set of cranks is much shorter than the other. [I used toe clips and straps for Jacob when he was little. It may not be possible to find child-size shoes for a clipless system, or to adjust the pedal release force low enough. For a small child, you will want to install the shortest toe clips, but it isn't necessary for the toes of the shoes extend all the way to the front. An alternative approach, recently re-popularized, is the trailer cycle, a "half-bicycle" which attaches to a conventional single (or tandem) bicycle as a trailer. These also allow your child to pedal, although not in synch with you. They don't handle as well as tandems, but are a very good solution for many families. This may seem like a lot of trouble and expense to go to for a bike that may not see that many years of use, and it isn't for everybody. Nevertheless, for parents who care about cycling and want to share it with their children, I believe it is well worth it. It is not necessary to buy a $2000 bike to ride with kids, in fact much less expensive machines will do the job. The fact that kids are small and light causes them to put much less stress on a tandem than an adult does. Tandems that are only barely acceptable for use with two adults may be perfectly satisfactory with child stokers. Keep an eye out for a used tandem in online classified ads and through bike clubs. They do show up. A cheap "beach resort" tandem can be upgraded to work well with a child stoker, and we have an article showing how. If you are handy with tools, you could even build your own out of two single bikes. My wife and I have two kids and two kidback tandems. We have put thousands of miles on them together, including several multi-day tours. They are our favorite bikes. The opportunity to share cycling with our children this way has been beyond price.